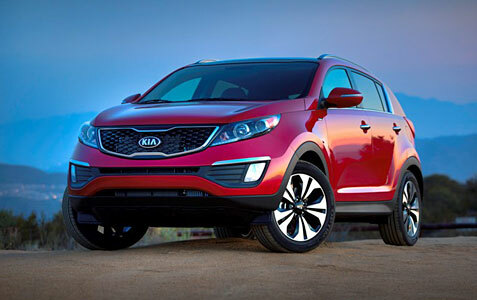 There is no denying the Hollywood good looks of the 2013 KIA Sportage SX AWD, but can this crossover deliver on the road? After a week behind the wheel, there is no doubt that there’s so much more than just curb appeal to this sleek ride from KIA, with impressive power, outstanding fuel efficiency and loads of comfort and convenience features. The 2013 Kia Sportage offers a high beltline, sweeping angles and pronounced wheel flares, conveying an indomitable road presence with an aggressive, hunkered-down stance. The full-sectioned body, defined by a spearing shoulder line throughout the length of the car, helps to visually connect the headlamps and tail lights. The crispness of this line, together with its lowered body, creates a distinct sense of precision while the pronounced C pillar conveys an air of solidity and balance when viewed from the side. Like all vehicles across the Kia lineup, the Sportage’s front end proudly displays the face of the brand’s signature tabbed grille and dramatic swept back headlamps. The dynamically sculpted hood, framed by a distinctive windshield design, adds to Sportage’s fresh appeal. The rear view offers a clean and contemporary look with dynamic tail lights set within the rear lift gate. Our red test model was a top-of-the-line Sportage SX with a powerful yet fuel-efficient 2.0-liter turbocharged GDI engine producing 260-horsepower, unique 18-inch alloy wheels, dual exhaust, sculpted side sill moldings and unique SX grille. One of the better looking exterior designs for a crossover regardless of price! The good looks carry over with ease into a modern and smart interior that has much more room that one might imagine. KIA has created an inviting and comfortable environment with a host of convenience and technology features in the 2013 KIA Sportage SX AWD. With the signature three-gauge instrument cluster set prominently within the dash, Sportage’s interior exudes a contemporary design and sporty driving experience. An impressive collection of technology features come standard on the 2013 Sportage, including an AM/FM/CD/MP3/Sat audio system with available Sirius XM Satellite Radio and three months complimentary service, standard auxiliary and USB audio input jacks with MP3 capability, Bluetooth hands-free phone, and streaming audio connectivity with steering wheel-mounted voice activation controls that allow drivers to keep their hands on the wheel at all times. 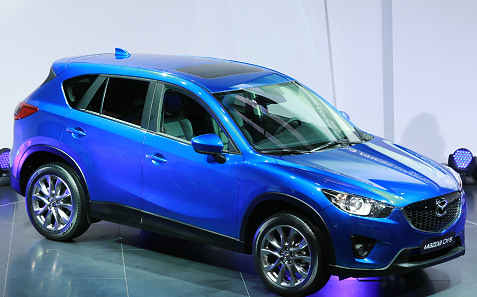 Mazda invited us to join them in Frankfurt as they unveiled the new CX-5 Crossover SUV at the Frankfurt Motor Show. The crossover market is exploding, and this new vehicle gives Mazda with a strong entry in the small crossover segment. The CX-5 is a completely new vehicle for Mazda from the technology to the design language. Mazda CEO and President Takashi Yamanouchi proudly introduced the new vehicle at the auto show along with Chief Designer Masashi Nakayama and Program Manager Hideaki Tanaka. As you can see from the photos above, the styling on this all-new crossover is sporty and aggressive. CX-5 becomes the first production model to feature Mazda‘s new design theme, “KODO – Soul of Motion.” Chief Designer Masashi Nakayama explained: “With the CX-5, our focus was on expressing a strong sense of vitality and agility. We looked at videos of cheetahs; their agile footwork and how they use their entire body as a spring to accelerate rapidly and change the direction instantly. They emanate great energy throughout their entire body. Inspired by their efficient yet beautiful movements, we aimed to push the SUV appearance to new levels with KODO design language.” The prominent front and rear fenders and sculptured body sides give the CX-5 a distinctive look, and we’ll start seeing the new front grille and face of the vehicle showing up on other Mazda cars. The CX-5 will be introduced progressively to global markets beginning early next year. This is the first Mazda developed completely around its new SKYACTIV TECHNOLOGY, which includes all-new gas and diesel engines, manual and automatic transmissions, body and chassis. North American president and CEO Jim O’Sullivan explained to us that the CX-5 was truly a clean-sheet design from the ground up using this new technology, and all of these elements will start appearing in other Mazda models in years to come. This approach on the CX-5 also allowed Mazda the opportunity to achieve significant weight savings as well which will have a significant impact on gas mileage. The company clearly nailed the styling on this one and it should appeal to single buyers along with consumers with small families. The interior room and functionality was impressive. I’m anxious to drive the CX-5 once it’s ready for production as Mazda consistently delivers on vehicles that are fun to drive.